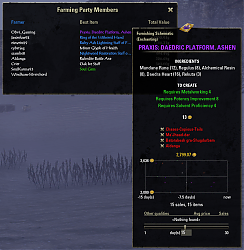 A simple addon that aggregates the items your group gets while farming and provides notifications and a leaderboard based upon Arkadius' Trade Tools, Master Merchant, or Tamriel Trade Centre pricing values. - Errantly removed API version for Murkmire. - LibPrice integration. You must install this lib manually. - Ability to prune members no longer in group—useful when you want to clean up the list when tracking is off. Yep, I screwed up in my rush to release a fix last night to another issue. I tried to have someone else test it before releasing, but there was some miscommunication. 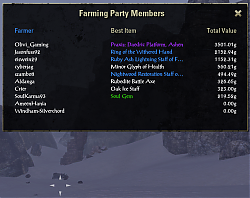 Should be fixed with 2.11.2.
directory name: Farming Party ! Updated today. Addon no longer shows in the addon list in the game. Minion sees it normally and it is still in the folder where it should be. The loot log window is not currently resizable, but several people have asked for it, and it's something I'm going to look into. There's a setting to disable logging to chat right now if you want to turn that off. I've now added resize and timestamp support to the loot window. Scroll support will have to come later, but you can see a long history now. Last edited by Aldanga : 04/01/19 at 06:22 PM. thx for this great addon - i love it. Is it possible to add timestamp to windowed loot ? Could you point out to me with a screenshot where you would like a time stamp? Last edited by EinsErr0R : 02/17/19 at 12:27 AM. - Have a toggle in the settings for account wide settings instead of individually configuring each character. - Have the score board be able'd to be closed out with the 'ESC' ke and the individual scoreboard as well. - Enable the ability to resize the windows in the settings. What an awesome addon idea! Last edited by EinsErr0R : 02/04/19 at 12:15 AM. Hey ya! Really do appreciate the quick response, and apologies for not replying sooner, I just wanted to properly check out for myself what you described, before getting back to you. The sliders change the transparency of the different windows. Two for each window, one controlling the foreground and one controlling the background. 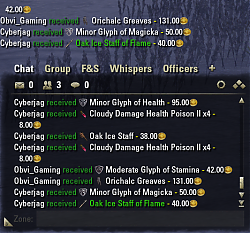 If you want to see all items that have been farmed, you can open the members window (the command is /fp or you can use a keybind). Next to each member in that window is a plus icon, which will open a window showing that user's loot that has been tracked. Is that what you're looking for? Or do you need some additional functionality? Ah, I totally missed that. I found the party window because of the keybind, but it seemed to me like nothing was happening when I clicked the button beside a member's name. Turns out that the window was opening behind some other elements. That being said, this was EXACTLY what I was asking about. It maintains whatever status you previously had. 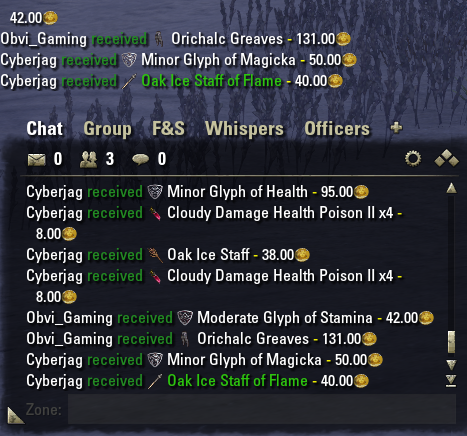 If you enabled loot tracking before, it'll stay on when you relog. The opposite is also true. The window state is not currently saved, but I consider that a bug which needs to be fixed. Got it! In this case, my confusion was because I logged in on a different character, and only later today noticed in the Saved Variables that the settings are stored independently for each character. Logged back in on my main today, and it did remember the tracking state I set earlier. Your points about UI/UX problems are valid. I've known improvements are needed, but other things in life have been more important recently. Yeah, I've had several people ask about making improvements to the log window, particularly making it scrollable. I will see what I can do about that. I feel ya. RL first, of course. For me personally, the UI doesn't need much fixing, and anything you improve will likely be more aesthetic than anything (I think the functionality is spot on). Since you mentioned scrolling, when you do get around to it, there's an addon you could check out, called 'Advanced loot tracker'. It has a nice scrolling mechanic, I think. But like I said, I dont consider such things urgent in any way. An indicator for tracking being enabled/disabled is on my short list of things to do, as well as a graphical way to start/stop. I could also add a keybind, as that's relatively simple. Perfect, this is the kind of thing I'd like to see added. Also, now that I saw that window that shows the info about a member's loot, could you also maybe add a keybind to bypass the party window and bring up/close that window directly for our character? I must say, this really is one of the most satisfying addons I've come across in a long time. I figured out a simple way to parse the saved variables for the loot counts, and have now finally started a logging and analyzing the resource turnover for doing daily crafting writs, collecting surveys, and other stuff like that. Again, can't say it enough - thank you!!! Last edited by Aldanga : 07/28/18 at 04:35 PM. Hi mate. Nice addon! I love the concept, and think this has many potential uses for solo players as well for guilds, events, etc. Just wondering if you could clear something up for me, though. * There are four sliders in the settings panel, but i can't figure out what any of them are for. * Does the add-on begin tracking loot on startup by default? With regards to the UI, I have some suggestions you might be able to implement in a future update. * Some sort of indicator (little red/green circle?) to show whether tracking is active would be helpful. * A keybind to start/stop the tracker? I know I'm pushing it now, but I'm so excited about this addon! More ambitiously, I'd like very much to see this addon develop to the point where a user could press a key to display a little window that shows some simple info about crafting mats picked up while the tracker has been active (stuff like Name, quantity farmed in the session, and total held in [backpack/bank/craftbag]). I took a look at the saved variables your addon generates, and I did notice it already gets most of that info. Either way, really do appreciate the hard work you put into this. Cheers! OK, I've got motifs and gear exclusion options now. Would a junk filter help as well? Stuff like foul hide, etc. That's easy to exclude. Just looking to bundle up useful new features into a single release. ETA: Added the quality filter just in case. Will do a release later today. Last edited by Aldanga : 04/07/18 at 01:18 PM. 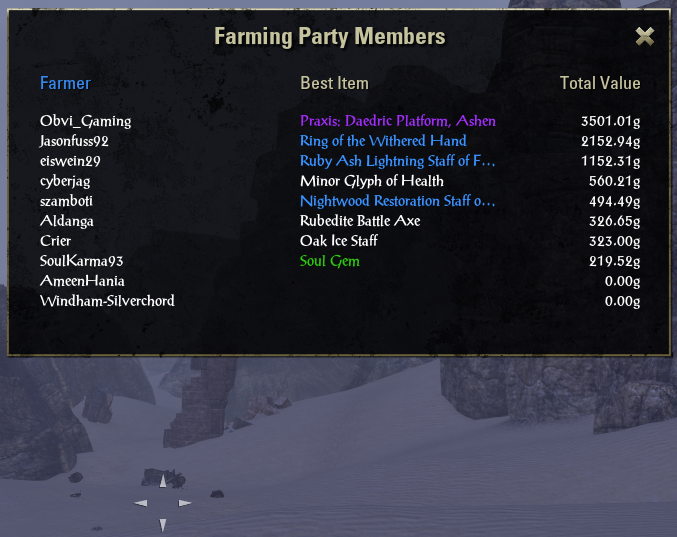 I'm glad Farming Party is seeing productive use. I can certainly look into the filtering option. 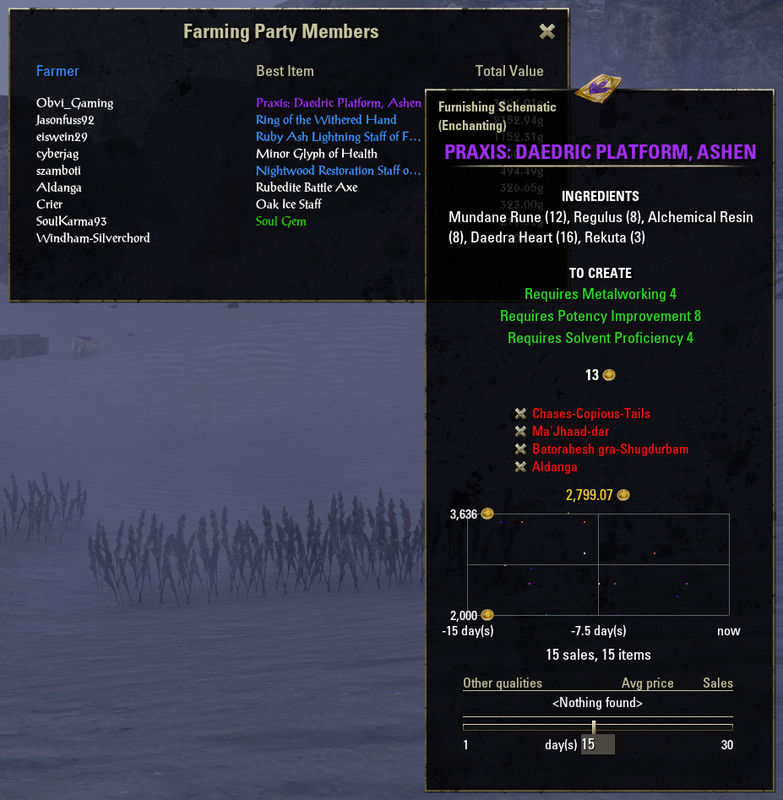 I have seen similar issues when running farming events for my own guild, and considered adding a filter like you described, but hadn't had much reason to until now. I will look into excluding certain categories of items from the farming event. It might take some time, but it's feasible. We'll see how it goes. Last edited by Aldanga : 04/07/18 at 08:20 AM.